Welcome to Day 76 of 100 Days of Disney here on The Purple Pumpkin Blog! Be sure to check out all of the other posts in this series, and if you would like to share your own Disney blog posts or pictures, make sure you check out the #100DaysOfDisney Link Party! It does always seem that I say “this film is one of my favourites” but I’m so flakey that many films are my favourite! 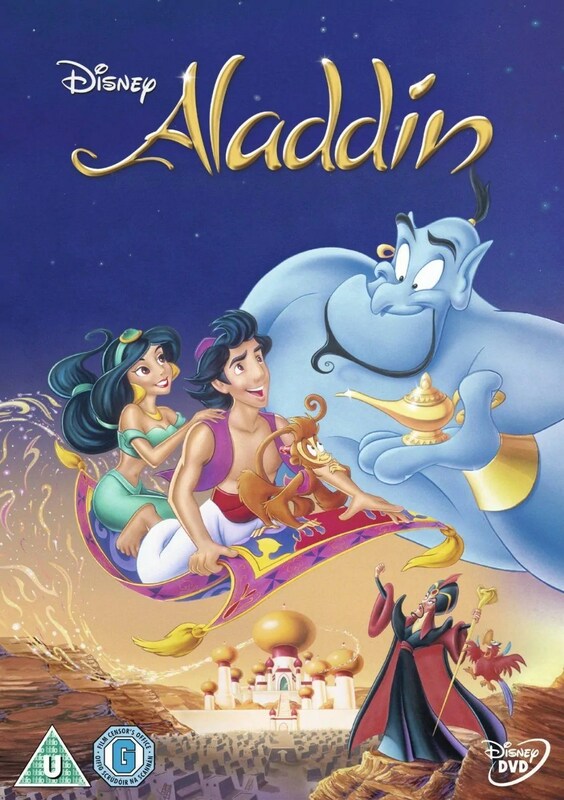 This week it is the turn of Aladdin… I watched this film so much that I could recite the film as I watched – I have no shame in admitting that! Jafar, the Grand Vizier to the Sultan is trying to obtain a magical lamp from the Cave of Wonders, but soon learns, to recover said lamp, he needs to find a diamond in the rough. Meanwhile, Jasmine, the Sultan’s daughter is frustrated with her life, and runs away into the local market where she meets street rat, Aladdin and his pet monkey, Abu. Jasmine and Aladdin form a friendship, when he is arrested for theft and thrown into the palace dungeons. Jasmine orders Jafar to release him, but he tells her that Aladdin has already been executed. She is heartbroken. Whilst locked up, Aladdin meets a fellow prisoner, a very old man who tells him about the Cave of Wonders and promises to reward him if he fetches the lamp for him. They escape and arrive at the mouth of the cave – a huge tiger head which warns Aladdin to touch nothing but the lamp. Along the winding cave to the lamp, Abu and Aladdin meet a magic flying carpet. Just as Aladdin retrieves the lamp, Abu’s eyes are drawn towards a shining gemstone which he picks up, causing the cave to collapse around them. Magic Carpet flies them to safety, and the old man (who is Jafar in disguise) takes the lamp, pushing Aladdin and his friends back into the cave as it closes for good. It turns out that Abu stole the lamp back, and eventually, Aladdin releases the magic genie. The genie grants Aladdin three wishes after explaining the rules…he can make any wish he likes with the exception of murder, romance, revival of the dead, or additional wishes. Aladdin tricks Genie into escaping from the cave, and whilst contemplating his wishes asks Genie what he would wish for. He tells Aladdin that he would wish for his freedom since he is a prisoner in the lamp, but it can only be made by the master of the lamp. Aladdin promises to use his last wish to free Genie, and then wishes to be turned into a prince so that he can court Jasmine. … but she soon figures out that it is the street rat, Aladdin, and tricks him into admitting it and demanding the truth as to his identity. He convinces her that he really is a prince but dresses like a commoner to escape palace life, to which she can relate. Aladdin returns the Princess home, and is captured, then thrown, bound and gagged into the ocean. Jafar once again tries to make a second marriage advance on Jasmine, but Genie has rescued Aladdin (he made a nod to a wish request to be rescued) and Aladdin reveals Jafar’s plot. As Jafar flees the castle, he sees the magic lamp on Aladdin’s belt and plots his revenge. Aladdin meanwhile starts having second thoughts about using his last wish to free Genie, thinking that Jasmine will not want him just as he is. Iago (Jafar’s pet parrot) steals the lamp and gives it to Jafar who now becomes the lamp’s master. He uses his first two wishes to dethrone the Sultan, and to become a powerful sorcerer. He uses his new powers to enslave the Sultan and Jasmine, then banishes Aladdin and Abu to a frozen wasteland. They escape by using Magic Carpet to fly back to the palace. Aladdin, realises he can’t keep up the act of being a prince, and finally, true to his word uses his final wish to free Genie. Seeing this act, and Aladdin’s love for Jasmine, the Sultan changes the rules of the kingdom so that the sweethearts can marry, while Genie then uses his new found freedom to explore the world! became the 14th (and the first animated movie) to gross more than $200,000,000. Robin Williams – as the Genie he is BRILLIANT. I know that he ad libbed a lot of his lines and this made for some great comedy. Day 76 of #100DaysOfDisney is done – 24 to go!